Learning How to Dance in the Rain ....: Results !! Well Tuesday arrived and we went to hear the results!! Once again we sat in the outpatients - really think there should be some sort of frequent flier card - 10 stamps and you get a reduction in your parking fee at least! The same registrar called us in - my surgeon was apparently away on a conference in another state. So he sat us down - my seroma was the size of a small orange again and I was desperate to have it removed- but he went straight into the report. They identified the lumps as 2 seperate tumors - one was 18mm and the other 25mm. Bizarrely each tumor showed different features both were responsive to oestrogen and one was responsive to progesterone and her2. The best bit of news was that there was no sign of anything in the lymphnodes - they had removed 10!!!! This would explain all my discomfort and pain apparently! So the cancer at the moment appears to have restrained itself to the breast - yeha!! Its a funny sort of thing getting results on the one hand the news is good and yet on the other it reconfirms that you have cancer and that you need treatment. As the tumors presented with different components - I am now up for the full cocktail. Possible radiotherapy, chemo, hormonal treatment and herceptin. Basically the year will be filled with intra-venous delights and other medical treats - it is quite overwhelming when you look at the long term plan - so I am looking at one day at a time! The surgical registrar couldnt give us details and said we needed to wait for an appointment with radiotherapy oncology and medical oncology. So we were still waiting for our game plan!!!!!!! Thankfully he then drained the seroma - 100mls , gave me a script for some stronger painkillers , made another appt for next week and off we went!! My poor husband had to rush off to work and my lovely friend took me home!! I am so thankful to have my friend overseas who is a breastcare nurse as she is such a source of knowledge and honesty to me. It is such a blessing just being able to send an email with results and questions to someone who works in that field everyday!! So I spent the night googling treatments, drug protocols etc. So much to learn! B is back to work now so the next day I had 2 visits from friends - lovely to see friendly faces. Good to have a distraction and a laugh! My dishes were washed and ironing done before my eyes! Such a priviledge to have people who care about you - very humbling! It feels like my life is just moving between one hospital appointment and another - I have 3 next week!! 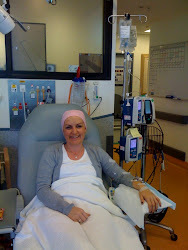 Physio, surgeon and radiotherapy and I have my appt with the chemo team in 3 weeks! It seems I will have a while to wait before knowing the game plan after all - was a bit disappointing at first but my eldest daughter turns 13 in about 2 weeks so if I can get this pain more under control then I can concentrate on giving her a happy day before the next chapter!! Met a lovely physio today - she went through exercises and a plan to prevent my shoulder ceasing! I have so much to remember I am going to have to set my alarm to remind me what I have to do - so if you see me moving in strange manoevures before you eyes - be not afraid!!!! I want to be able to return to full motion in my arm - you should see me trying to get dressed - I should audition for the circus! My friend who took me to the appointment helped me get a few bits and pieces from the local shops before heading home . I was so glad she was with me at the physio as I haven't even started chemo yet and my brain doesn't feel like its firing on all cylinders! Just as well I can't drive! I arrived home and another family friend popped in laden with yummy melktert and all! Lunch was made for me and we sat and had a lovely chat. She said I was looking tired and I should go and lie down - to be honest the mornings activities had left me shattered. So I lay down saying I wouldn't sleep - famous last words - I woke up to the girls knocking on the door , my lovely friend had unpacked the dishwasher , cleaned up the kitchen and left me a note without me even waking!! This weekend we have some excitement on the horizon - Granny and Grandpa are arriving from overseas. The trip had been planned before my diagnosis - so their holiday to the sun has taken a different twist now. Sadly I wont be able to be the hostess with the mostest this time round - will be more a self catering trip with few added extras! It will be wonderful for B to have his folks at hand and also for the girls to have the extra attention and cuddles. I have whirled through this week and left gaps I know - a lot has happened with the many appointments ( haven't even mentioned the pest man, cleaner and dog groomer !!) etc but thought I best get blogging before too much has passed and all I will remember are the gaps - eek!